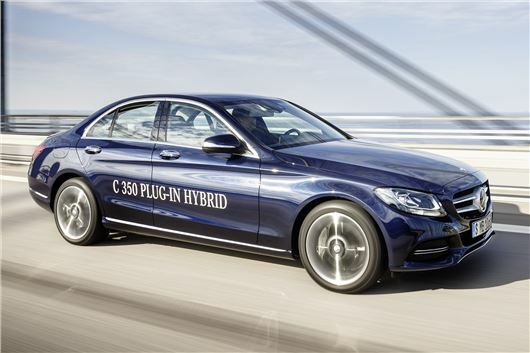 Mercedes-Benz has unveiled the C-Class Plug-in Hybrid. The new model will return up to 134mpg and go on sale in the UK in July with an estimated price tag of £45,000. Available as a saloon or an estate, and giving BMW et al something to worry about on the company car options list front, the new C-Class model will emit just 48g/km CO2. That said, the list price of the C350 means it’s unlikely to hit BMW 320d sales too hard, as it’ll probably hover close to the £45,000 mark based on its place above today’s £42,500 C300 Hybrid in the C-Class range; Mercedes-Benz is yet to announce official prices for the C350. The plug-in hybrid drivetrain comprises a 211PS four-cylinder petrol engine linked to a 60KW electric motor for a combined output of 279PS and a whopping 600Nm - so this is no chuntering eco runabout. The 0-62mph benchmark is done in 5.9 seconds. Electric-only drive is limited to 19 miles, and the battery can be charged from a wallbox or public quick charging facility in one hour 45 minutes. Power is sent to the rear wheels via a 7G-Tronic automatic gearbox, and the battery can either act alone as a power source, or in tandem with the engine as an additional boost. Boot space is compromised considerably by the battery, which adds around 100kg of additional weight, with the saloon’s shrinking by 145 litres to 335 litres, and the Estate’s from 490 litres down to 350. But Mercedes-Benz believes that plug-in hybrid technology is worth taking a punt on, with ten new models planned between now and the end of 2017, spanning a broad section of its range. A plug-in GLE crossover 4x4 is expected next – a model unveiled in high-performance AMG guise alongside the C350 at the Detroit Motor show. Read about that here.